We all know that the Cirque Le Soir London is one of the most popular and celebrity-laden nightclubs in London. In fact, the Cirque Le Soir Guestlist is always full on the weekends, that is why it is recommended to book in advance. 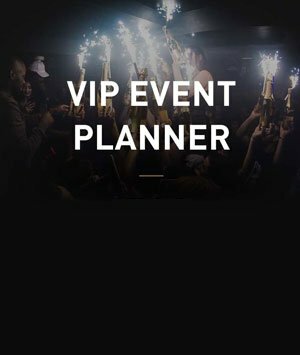 Getting your Cirque Le Soir Table Booking is easily done and free if you book with the London Night Guide team. 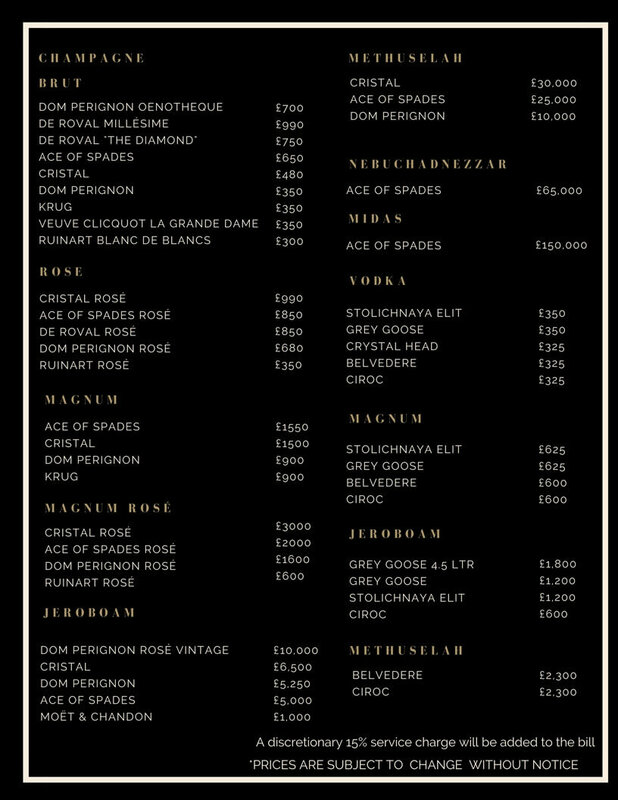 However, people are still asking what are the Drinks and Bottle Prices Menu for Cirque Le Soir Club, so here it is. By the bottle orders are allowed on Cirque Le Soir, however, the highlights of the menu are the special packages they offer. These are available especially for the Cirque Le Soir Birthday Packages that is recommended for your special occasions. 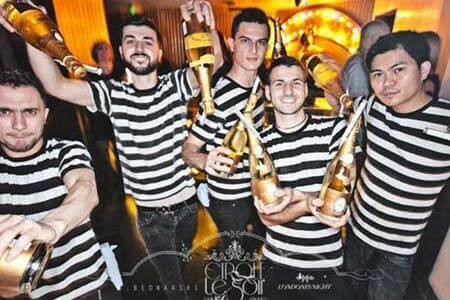 What is the Cirque Le Soir Bottle Price Menu anyways? The Flying Dwarf Show is a combination of the following goodies: 1 bottle of Dom Perignon Jeroboam, Dom Perignon set of 5 bottles, & complimentary shots in a tray – which is delivered by a Flying Dwarf. This is also accompanied by your own choice of music, and it is priced at £7000. Probably one of the better deals on the Cirque Le Soir Bottle Price Menu. The “High Roller’s Show” is available for £3500, and it includes a special performers show. 10 bottles of Dom Perignon is more than enough for a big party, and it is also partnered with a complimentary tray of shots. Definitely one of the crowd favorites here especially the Cirque Le Soir Celebrities. 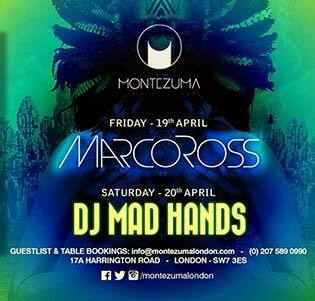 Whether you are on the Cirque Le Soir birthday party deals or not, the “Birthday Bonanza” is available for you to grab, and it is a bundle of 1 bottle of Belveder Magnum, 5 bottles of Dom Perignon, a complimentary tray of shots, and birthday cake delivered by the Cirque Le Soir acts. Your name will also be mentioned by the DJ, so this is such a treat! By the way, the Cirque Le Soir Entry Price is £20. Champagnes (White, Rose) are also on the menu, and the celebrity drink of choice Cristal Rose is priced at £990. Vodka is also on the menu, with the Grey Goose bottle priced at £350, and the Ciroc bottle at £325. The Belveder Methuselah has been a great experience, and with a bottle of price of £2300, it will suit really well with your elegant style. Please do remember to follow the Cirque Le Soir Dress Code to the dot for you to be granted quick access to the club premises. For other inquiries for the Cirque Le Soir Bottle Price Menu, just drop us a line.